PAUL Rowley maintains the Super 8s are weighted heavily in favour of the four top flight clubs making it almost impossible for a Championship side to reach Super League. The Leigh boss has guided his side to back-to-back Kingstone Press Championship Leaders Shield wins. Centurions also enjoyed Challenge Cup wins over both Salford and Wakefield during the season. 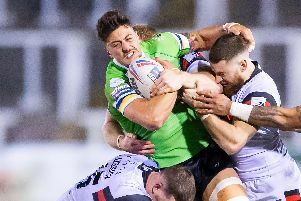 But in the new Super 8 qualifiers, Leigh have been beaten by Hull KR and Salford and their hopes of the top three finish which would guarantee promotion are looking slim. “Because of the differences in salary cap between Super League and the Championship we were unable to recruit in the way Wakefield have ahead of the Super 8s,” argued Rowley. “The new players they brought in have refreshed them because they’re enthused and look buoyant at a time when the Championship players are looking battle weary. They can sign players who haven’t got the bad habits from a season of struggle. “It’s like being promoted to Super League then being told you can’t sign any new players. The magnitude of the task is huge. Rowley says Leigh will be treating Saturday’s game against Wakefield “like a Grand Final” and has urged fans to continue backing them in big numbers.